Beautifully engraved certificate from the Winchester Repeating Arms Company issued in 1929. This historic document was printed by the American Banknote Company and has an ornate border around it. This item is hand signed by the Company’s Assistant Treasurer and is over 82 years old. 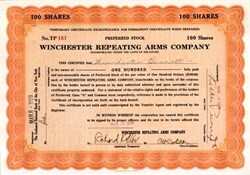 The certificate was issued to Winchester Bennett. Winchester Bennett was president of the companty from 1915–1918 and was the son of Thomas Gray Bennett. Winchester - The name evokes images of the Wild West, cowboys and Indians, the taming of the frontier. And since its beginnings in 1866, Winchester has sustained the romance and legacy of its remarkable heritage as an American original. Winchester firearms accompanied American settlers as they moved west to seek their fortunes in a virgin land. Winchester's image became one with that of the cowboy, the indian, the lawman, the pioneer, the mesa, the mountains, the desert, and the grandeur of the west. Small wonder that Winchester is called "The American Legend." The famous horse and rider logo used by Winchester on its products symbolizes that legacy. The Winchester Repeating Arms Company produced the first firearm to bear its name in 1866 - the Model 66. In 1873, the company began to expand its operations to include increased ammunition manufacture. To coincide with the introduction of its new Model 73, the company claimed it was "prepared to manufacture 250,000 cartridges per day, embracing every size and description of a quality superior to anything heretofore offered." By 1875, cartridge capacity had been stepped up to a million a day. The decision to expand ammunition production was one of the major policy changes in the history of Winchester. It marked the first step toward making the company one of the largest and best-known manufacturers of ammunition in the world. Smokeless powder entered the market in the 1890s. The adoption of smokeless powder for ammunition was one of the major innovations affecting the entire history of firearms, and started a new phase in the development of guns and ammunition. Winchester began to produce smokeless cartridges, but did not reduce its offerings of black powder shotshells because, as was the case with metallic ammunition, smokeless powder did not eliminate the demand for black-powder loads. Winchester owes its fame to many sources. However, one man did much to spread the fame of the Winchester firearm more than any other -- Buffalo Bill. While Buffalo Bill was never employed as a shooter by Winchester to publicize the company's products, he directly and indirectly did much to increase the company's exposure. As the hero of fictionalized Western dime novels, he was often armed by the authors with a Winchester rifle in his fights with the Indians and the bad guys. In the famous Wild West Show, he and his fellow marksmen, including Annie Oakley, used Winchester rifles and ammunition. The Winchester Repeating Arms Company did not fail to publicize the fact that its products were the choice of Buffalo Bill and his fellow star performers. Theodore Roosevelt was another one of the famous folks that used Winchester products and publicized that fact. During the late 1890s and early 1900s, several companies in the United States began to develop as integrated ammunition organizations. One of those was the Western Cartridge Company, which was also a powder manufacturer. In 1892, Franklin W. Olin and his associates formed the Equitable Powder Manufacturing Company at East Alton, Illinois, to manufacture black powder which was sold chiefly to the mines in the area. However, because that business was seasonal, Olin became interested in loading shotshells. In February 1898, he persuaded his associates to join him in forming the Western Cartridge Company, also located in East Alton, the principal purpose being to provide a market for powder which could be produced by The Equitable Powder Company in the off season. With the outbreak of World War I, interest in negotiating contracts for arms and ammunition picked up sharply. 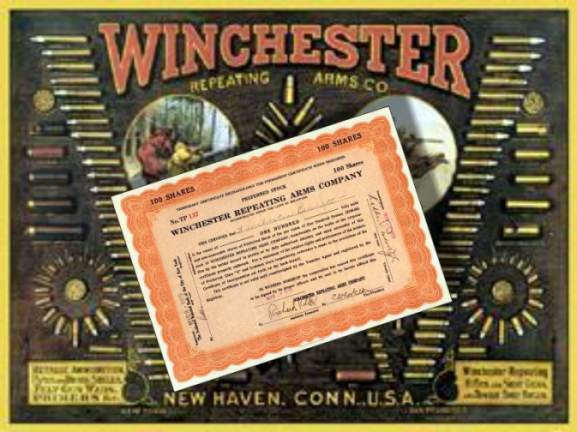 When the United States declared war in 1917, Winchester again was called on to fulfill contracts for arms and ammunition. The purchase of Winchester by the Olin interests brought a breath of life to the institution and brought to Winchester many things. A major benefit was having the leadership of John M. Olin, son of company founder F.W. Olin. When John Olin, at that time First Vice President of Western Cartridge Company, came to New Haven to find out just what he and his associates had purchased, he found stored-up accumulation of new gun models and ideas. He was able to make an accurate appraisal of each model and to introduce a number of revolutionary ideas he had in mind. John Olin was a master inventor and his name appeared on more than 20 patents, several of which dealt with Super-X developments. Super-X ammunition, probably Western Cartridge Company's most widely known product, resulted from his work during World War I. Super-X was a major development in the ammunition industry early in the post-war years. It came, according to John Olin himself, partly from his personal desire to teach sportsmanship to a hunter who shot ducks on the water rather than on the wing. Olin even suggested to the greedy hunter that if he needed meat on the table he should go shoot a cow. "You can get a thousand pounds of meat with one shell." On December 14, 1940, a contract was signed with the government for the United States Cartridge Company, a subsidiary corporation of the Olin owned companies, to build and operate the St. Louis Ordnance Plant, the greatest small arms plant in the military history of the nation. At its peak production period in 1943 the plant had 34,338 employees on its payroll. Manufacture of ammunition components began October 20, 1941, and the first finished ammunition came off the line at the new plant on December 8, 1941, the day after the Japanese attack on Pearl Harbor forced the United States into World War II. Total production of .30 and .50 caliber rifle and machine gun ammunition at the St. Louis Ordnance Plant during the war, 6,738,009,746 loaded rounds, exceeded the output of all of the nation's small arms ammunition plants in World War I. In addition, the Western Cartridge Company plant at East Alton produced 4,022,621,734 loaded rounds of ammunition, and the Winchester plant in New Haven another 4,499,493,774 rounds. Thus a total of 15,260,125,254 rounds of ammunition were produced by the various Olin companies during World War II. In December, 1980, the company's board of directors authorized the restructuring of the Winchester Group to allow Olin to better focus more of the company's resources on Winchester's sporting and defense ammunition business. In the restructuring, the company's U.S. sporting arms business was set up as a free standing operation, which subsequently was sold to the U.S. Repeating Arms Company in New Haven, Connecticut in July, 1981. The New Haven operations had been part of the company for nearly half a century. That company produces Winchester brand rifles and shotguns under license from Olin Corporation. In 1991, Olin's Winchester Division again played a part during a war. The Persian Gulf War broke out and Winchester provided a large amount of the ammunition used by U.S. troops during this conflict. The history of Winchester is a rich one that continues today. The company who brought to life "the gun that won the west" is the same company who today continues to supply sportsmen with the best sporting ammunition in the world.